In a run-down asylum, screams echo in the halls as mysterious creatures roam, terrorizing the staff. Patients complain of betrayal rather than illness, and no-one is quite what they seem. Why does a medical facility need to be under armed guard? What procedures are the staff carrying out, and to what purpose? What is the price that must be paid for making an agreement with those who run the asylum? 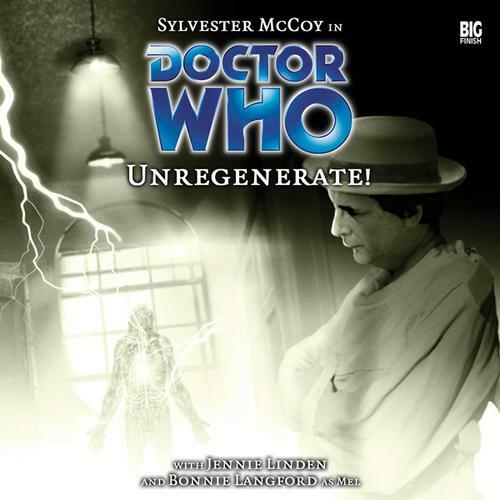 Sylvester McCoy is the Doctor in Unregenerate! March 26, 2005; the initial broadcast date of Rose, the first original episode of Doctor Who to air since the 1996 television movie (or, if you want to get technical, since 1989’s Survival). Viewers were enthralled by the new Doctor, played by Christopher Eccleston, and perhaps a bit taken back by the “wow, the pop star can actually act” performance of Billie Piper. While tying back to the classic series through the use of the Autons and the Nestene Consciousness as villains, Russell T Davies introduced a new concept to the Who mythos; the Time War, a huge temporal conflict, spanning across all of recorded history, that saw the destruction of the Daleks and the annihilation of the Time Lords, both at the hands of the Doctor. June, 2005; the initial release of the 70th story for Big Finish’s monthly range of Doctor Who stories, the Seventh Doctor serial Unregenerate! A off-kilter tale with a babbling Doctor, a desperate companion, a mental asylum without a visible interior, and medical staff who make strangers an offer they can’t refuse, Unregenerate! moves quickly with a solid secondary cast and a dark reasoning behind the staff’s action that ties into the growing desperation of the Time Lords. where he was is revealed in episode three, but it’s handled in a non-linear manner compared to the rest of the story, adding a bit of unnecessary confusion to the proceedings. Also, the climax to the story is incredibly flat. The final showdown with the story’s ultimate antagonist is a proverbial bump on the head and a “well that’s taken care of.” It’s a bit of a letdown, redeemed by the actual conclusion of the story, but one would hope with the horrifying experiments being run inside the hospital that the on-screen consequences would be a little more dire and come together in a stronger fashion. If there’s one thing to take from Sylvester McCoy’s performance in Unregenerate!, it’s that this play would have made the perfect audition reel for his performance as Radagast the Brown in the Hobbit movie trilogy. It’s a weird performance choice, however. This is the first Big Finish story to be directly set after a Doctor’s regeneration, as it takes place directly after the absolutely rubbish Time and the Rani. The Doctor experienced post-regeneration trauma in that serial, but the symptoms and sickness were all dealt with by that story’s end. Here, immediately after, the Doctor is once again out of his gourd and out of his mind. While McCoy definitely nails the “confused, babbling, incoherent lunatic” portion of his role, with an explanation that makes perfect sense once its revealed, it’s when the Doctor is back to what passes for normal that things just don’t click right. The Seventh Doctor is well known as a chessmaster and schemer who is three moves ahead of his opponent before they even know they’re playing a game, but that characterization came much later during his time on television. Early on, especially with Mel at his side, the Seventh Doctor was a buffoon and a jester. He kept these tendencies later in his regeneration as he travelled with Ace, but since Unregenerate! takes place so early in this regeneration, one would expect a more clownish Doctor instead of one with a calculating plan both before, after, and during his madness. McCoy does a bang-up job with the part, but to me it comes off as him playing the right role at the wrong time. With the Seventh Doctor in a straitjacket for the first three episodes, Melanie Bush, in a way, takes over as the Doctor. Bonnie Langford’s Big Finish stories have mostly been a delight to listen to, with The Fires of Vulcan covering the dramatic side of things and The One Doctor holding up the panto end. The Juggernauts and Catch-1782 were a small step backwards for the redhead from Pease Pottage, but Unregenerate! shows Mel in fine form. On television, Mel was always lauded for her eidetic memory and computer programming knowledge…but instead of seeing those traits in action, we got Paradise Towers. THIS is the Mel that should been on television, working by herself or with the Doctor with a madcap determination. She even gets her own “companion” in the form of a cab driver who finds himself sticking by her side thanks to nothing more than sheer curiosity and having the necessary skills needed for the job. Mel sneaks, climbs, snoops, confronts, runs…and does all these things as the best companions always do! There’s a nice scene in the fourth episode where she tells the medical staffer playing Bad Cop to get stuffed (“hell nath no fury like a Melanie Bush scorned” – the Sixth Doctor) and the medical staffer playing Good Cop to come along and help her. The supporting cast consists of eclectic characters, some good, some “eh.” The standout performance belongs to the Cabbie (no name needed), played by Big Finish voice veteran Toby Longworth. The Cabbie is best describe as a “man who’s seen some shady stuff.” He constantly drops about the things he knows, but doesn’t outright mention them because it wouldn’t be proper to say to a lady, in that case Mel. Longworth hits the accent of a lower-class cabbie perfectly, and his deadpan astonishment at the things going on around him and the sights he’s seeing are almost in line with what an official companion goes through during their first trip with the Doctor. His final send-off at the end of this story is heartfelt, and if Big Finish ever decides to do a “Cabbie” one-shot audio, I’d be first in line to buy it. Hugh Hemmings plays Johannes Rausch, a post-War German immigrant who accepts an offer from a mysterious man for success in his new life in return for accompanying the man to a medical institute the day before his death. Rausch accepts the deal, and accompanies the man to the institute with nothing more than a goodbye note to his family, and then does nothing but ask questions. Hemmings does confusion well, but his performance as Rausch is incredibly one-note, and the one-note performance stays with the post-“death” Rausch who’s incredibly calm and collected for someone subjected to something so horrifying, aside from an initial moment where he tries to rip his own face off. John Aston plays Louis #2 with the “my God what have I done” realization very well also. the Daleks how this turned out when the Time Lords attempted to screw with their very creation. Even though the script for Unregenerate! was written well before the first mention of the Time War in the revival series, a listener could definitely see the seeds for that war being planted, in case via the Time Lords doing whatever they can to maintain control. It’s a glimpse into just how the stale, frozen culture of the Time Lords is starting down that slippery slope to the atrocities of the Time War that the means the Time Lords use to control human development (and also dabbling with other alien races, as shown by Sam Peter Jackson’s gestalt creature Shokhra) is by giving certain human beings the knowledge of time travel…by downloading the consciousness of a TARDIS directly into their minds! To the Time Lords, they’re simply ensuring that human beings “properly” develop time travel within well worn, well tread, well practiced guidelines. Of course, it’s a messy process since the human brain is a bit too small to handle the TARDIS programming, as well as the fact that the TARDIS tends to freak the HELL out when its infinite presence is collapsed into a single mind. Of course, since the researchers are removing people from their lives right before they die, the Web of Time is preserved, and isn’t that what’s important? While the presentation of this plan could have been handled better, the Doctor’s absolute revulsion to it hits home. This is why he fled Gallifrey all those years ago, and why the researchers threaten to send him back to Gallifrey to live out the rest out of lives, a fate worse than death for Time’s Champion. When I first heard the Time Lord’s plan, I was shocked and a bit sickened, much like when I heard about the Oubliette of Infinity from Neverland. It’s an idea I really wish had been rolled out with a bit more fanfare and a bit more impact, because it really drives home just how on the edge of falling Time Lord society has become and how those willing to stand up to that state of decay are fewer and far between in the days before the Time War. Unregenerate! isn’t the best story, but it’s one I’d recommend. There are flaws in its presentation and its climax, and a few of the performances could have been improved. The plot itself is solid, though. Melanie Bush shines through with the awesome aid of the Cabbie, and it offers a glimpse at why the Doctor left home and why he continually fights against his own kind. This entry was posted in Big Finish Review and tagged 3/5, Big Finish, Bonnie Langford, Doctor Who, Doctor Who Audio, Doctor Who Review, Mel, Seventh Doctor, Sylvester McCoy, TARDIS. Bookmark the permalink.